Opening: “Marylou loved everything about Herbie – how his slime trail glistened in the dark, how he could stretch himself thin to squeeze inside the cellar window, how he always found the juiciest tomato. Though she never spoke a single word to him – she was too shy – she thought about Herbie every morning and every night and most of the hours in between. Brief Synopsis: (From Publishers Weekly) “Herbie keeps finding Marylou’s poems, etched in slug slime and full of devotion, but Marylou keeps missing the longing letters he writes in return. While she watches his every move, he can’t find anyone who knows where she is so he can meet her.” How will the “slime-crossed” lovers ever meet? Links To Resources: Cool Facts About Slugs, Doorknob Valentine, Finger Puppet Valentine – (and with a little ingenuity, the last two could incorporate slugs! :)) Kids could make up their own poems like Herbie and Marylou. A children’s story, poetry or prose, maximum 200 words, about unlikely Valentines, posted on your blog (or in the comment section of mine) between Saturday February 11 and Monday February 13 at 5 PM EST. Add your entry-specific link to the link list on my blog so we can all come read your entries! There will be no new post on Monday so the link list will stay up. Instead, I will have a hitherto unheard of Tuesday post to celebrate Valentines Day, and that post will list 3 finalists (or possibly a couple more – you know how bad I am at choosing :)) for you all to vote on. The winner will be announced on Friday February 17 and will receive his/her choice of a copy of Ann Whitford Paul’s Writing Picture Books: A Hands-On Guide From Story Creation To Publication or a picture book ms critique from yours truly. And now, since I forgot last night – SO SORRY everyone, please blame the fever 🙂 – here is the link list for this weeks Perfect Picture Books. If you haven't read it, Loni, I think you'll like it 🙂 Also, as an illustrator I think you'll appreciate it because the art is really terrific! I confess it was originally the title that got me too! (I have a son :)) But the story lives up to the title – well worth the read! I know! I didn't even think of that when i made up the contest! So excited you're entering!!! And no, you weren't missing it – it wasn't there 😦 I put yours on. What a cute book! It's a perfect Valentines Day gift for my nieces and nephews. Hope you have a great weekend, Susanna! Susanna, can't open Picture a Tree. It just brings up a wordpress page nonrelated. This book looks sooo cute! Awww! Love your book choice and so excited about the contest. I have been running myself ragged at the LTUE conference, so I will do what I can. I'm crossing my fingers, I can write something up, but… if not – I'm still checking out everyone else's. 🙂 Can't wait! Sorry if someone already mentioned it but there is a book out there called Slugs in Love, Susan Pearson and David Slonim. I only know their next one: How to Teach a Slug to read! Ooops! 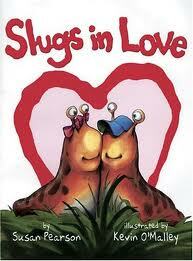 Okay , I'll write this again:there is a book called Slugs in Love, by Susan Pearson and David Slonim. I have only read their follow-up: How to Teach a Slug to Read. I'm afraid of drop offs: heights or even roads out in the marshlands. The what if's begin: What if I lose control of the car and run off the road? What if I lose my footing and fall, etc.